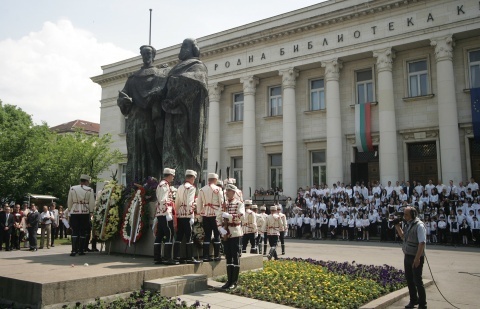 In Sofia, in the presence of senior state officials, members of academica and numerous guests, a solemn manifestation will walk from the National Palace of Culture to the monument of the two brothers in the square in front of the National Library. The first celebration in commemoration of Sts Cyril and Methodius occurred 157 years ago in a Plovdiv school, currently bearing the name of the Saints. The brothers were born in Thessaloniki, in 827 and 826 respectively. Both were outstanding scholars, theologians, and linguists. St. Cyril and St. Methodius invented the so called Glagolithic alphabet, the first Slavic alphabet, whose letters were based on the three holy elements for Christianity - cross, triangle, and cirle. Subsequently, it was modified by their Bulgarian disciples - St. Kliment of Ohrid and St. Naum of Preslav, with St. Kliment calling the new alphabet Cyrillic in favor of his teacher. Several centuries later, Patriarch Evtimii launched a literary reform and updated the alphabet, assuming that words are expression of the divine essence of things. The Cyrillic alphabet has been in existence for more than eleven centuries, but it was introduced for the first time in the European Union after Bulgaria obtained full membership in 2007. The Bulgarian language brought the total number of "linguae europeae" to 23. With its adoption the alphabets in use across the Union got enlarged by one more - the Cyrillic.